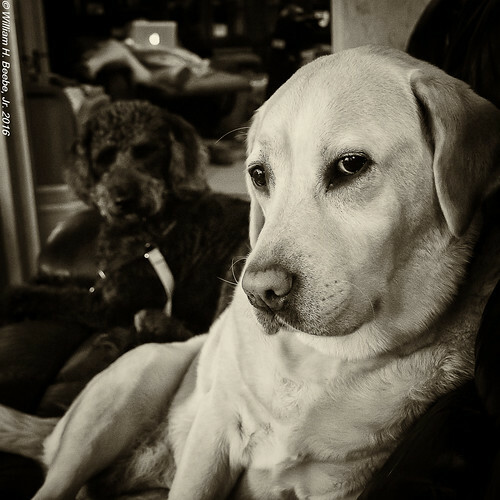 It’s been a while since I lead off with any of the household animals, especially the Labs. I can still call out plural Labs because Annie is a Labradoodle mix. Pride of place in this photo belongs to Ruby, who has perfected the side-long look like no other Lab that’s ever lived with us. She loves to hop up on the sofa next to me, sidle over close, and then give me that “come hither” look, which for a Lab means “walk hither.” Annie, back in the shadows, is watching, picking up tips. Her schtick are her flying leaps, which I’m assuming come from the Poodle side of the Doodle mix. The Mackerel Tabbies seem to be getting along pretty well these days, at least in the big cat tree. I’ve not checked in about a month, but back in April, at six months, the Gingersnaps were weighed at nine pounds each. Lulu, resting at the bottom, is a little over fourteen. Everybody realizes Lulu is our special needs cat, and they give her reasonable wide berth. 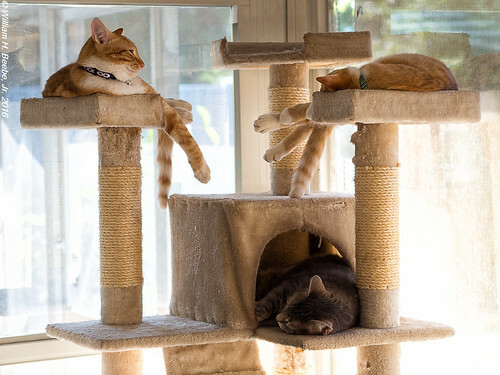 But when it comes time to nap, everybody gets along in the cat tree. As long as nobody but Lulu goes in the cat condo. I’m photographing more, but posting less. The breaks are good as long as the don’t become indefinite. Top photo was taken with the Olympus E-M10 and the 14-42 EZ pancake zoom, bottom with the E-M10 and 45mm Zuiko. I also took the luxury of post processing with Lightroom 6. I know I’ve written how I’m pretty much into using my Apple MBP as my primary driver. Which has meant that the old Samsung R580 running Ubuntu 15.10 has been sitting, forlorn and ignored in its bag. I hate wasting anything, especially a working computer, even the R580. So I pulled the R580 out of its bag and updated its 15.10 installation. And then, on a whim, I ran the updater a second time and got the notice to upgrade to 16.04. I figured why not? After about an hour of downloads and installs, the R580 rebooted into 16.04. And following that whim, I downloaded the Vivaldi Browser 1.1 Debian package and installed it as well. Easy peasy using dpkg. Since before its official 1.0 release Vivaldi had become my BFF browser, surpassing every other browser I’ve used (Firefox, Chrome, Opera, IE and Edge) across all my computers. And just like on Windows 10 and Mac OS X, it’s blazing fast. And I just like the way it works. Even the Gingersnaps, especially Luke, likes it. 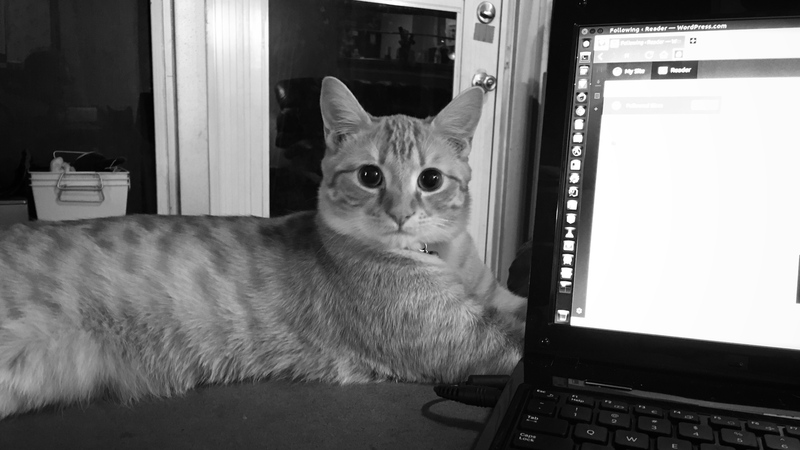 He’s also something of an Ubuntu fan cat, which is why he’s sitting next to the R580 above. I don’t know that I’ll dust off the R580 and start using it again like I have in the past. But for the record, I am extremely impressed that the R580 is still usable, and that Ubuntu 16.04 runs on it without any issues that I can see. Even though the R580 was purchased in 2011 with Windows 7 installed, it’s run Ubuntu as long as it’s run Windows, and run Ubuntu with a lot less drama (Ubuntu went on when Windows 7 corrupted itself). For the record this is the last version of Ubuntu Long Term Support I’ll install on the R580. I know I said that with the last LTS (14.04) and when the next Ubuntu release (14.10) came out it went on over 14.04. But I have a sneaking suspicion I’ve pushed my luck with this machine and upgraded Ubuntu as far as I reasonably aught to. It’s still usable and from my brief tour of 16.04, it’s as polished a Linux distro as you could ever want. And Vivaldi is as polished a browser as you could ever want. Especially if you want a Linux computer.